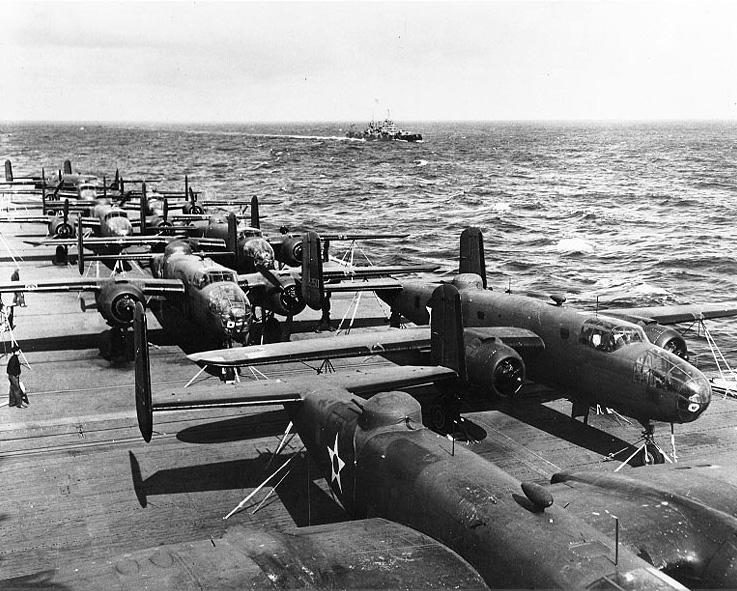 Sixty-nine years ago this morning, 80 very brave men in 16 B-25 Mitchell bombers launched from the deck of the aircraft carrier, USS Hornet. They and their leaders planned the mission well, but as they steamed toward their targets, they came across a Japanese picket ship. They did not know if the picket ship compromised their presence and position, even after sinking it. They had to make a decision; go now, or wait and fly as planned. If they took off in the morning, they would lose the cover of darkness. They were almost 200 nm away from their planned departure point and 10 hours early. This meant each of the 16 Army bombers would begin the mission short of fuel. As the leadership mulled over their decision, they asked questions regarding the success of the mission. Could they do it, or would it fail with the early launch. They also considered the problems of the Chinese in unoccupied China who were to help guide the airplanes in for a safe landing and refueling. There was much to consider and in the end, Doolittle and his Navy counterparts decided it was time to go. From left to right. Lt. Henry A. Potter, navigator; Lt. Col. James H. Doolittle, pilot; SSgt. Fred A. Braemer, bombardier; Lt. Richard E. Cole, copilot; SSgt. Paul J. Leonard, flight engineer/gunner. The ship’s speaker system blared the command, “All Army personnel, man your planes!” As the Army pilots, navigators, bombardiers, and gunners prepared to fly, Navy deck hands walked among the 16 Mitchell bombers passing out additional gas in 5-gallon cans. Still, it would be close. The crews fired up their planes and got ready. 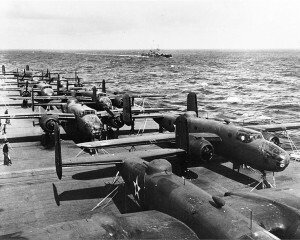 As the commander and leader of the others, Doolittle would be the first off the ship. Placed at the lead meant having the shortest deck run to get airborne. Remember, this was in the days before steam catapults; these airplanes were going to fly off the carrier into the wind over the deck on their own power. If Doolittle could not make it, more than likely no one else would either. As the Hornet turned directly into the wind and Doolittle revved his engines, all the pilots in the planes behind him stopped breathing for a moment. All eyes were on their leader. Doolittle released his brakes and started his roll. His bomber was in the air well before he reached the end of the deck. To the cheers of the other Army pilots and the Navy crews, America was now on her way to return the favor of Pearl Harbor to the Japanese homeland. 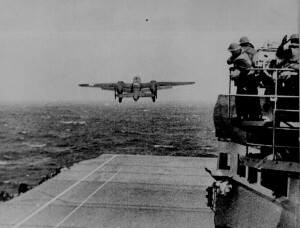 As Doolittle circled overhead to align his navigation equipment with the direction of the ship, the other bombers continued launching into the sky. They, too, circled overhead aligning their equipment and then headed on their way to their destinations: industrial targets in Tokyo, Kobe, Yokahama, Nagoya, and Osaka. The transit to the Japanese mainland would be routine with very little resistance along the way. The Japanese truly believed they were safe on their island and they had no need to worry about an attack from anywhere. As they flew to Japan, the bombers stayed low over the Pacific Ocean. The plan called for the pilots to maintain a low altitude to a point just before their targets. They would then sharply climb to a minimal safe altitude for weapons release. Each bomber carried only four 500-pound bombs along with a full complement of rounds for the machine guns. The bombs were a mix of general-purpose bombs and high incendiary explosive (HEI) bombs. The intent was to hit the military targets with the GP and spread fires through the complexes with the HEI. All of the Mitchells hit their targets and escaped to the west. Not one aircraft was lost over the targets. Indeed, only one suffered minor combat damage over the mainland. It was almost a milk run. Or so it would seem, as they headed to their destinations in China. The original plan called for the airplanes to leave the ship in the afternoon, which would put them over their targets late at night. They were to fly on to China to arrive at their escape airfields in the first light of morning. With the early detection of the fleet prompting the early takeoff, they would now be arriving late in the evening. Fifteen of the bombers made it to China. One turned north, the pilot concerned for fuel. He landed in Vladivostok, Russia. All 15 airplanes that went to China crashed in the darkness of the China skies. The aircraft that landed in Russia was confiscated and the crew interred until their escape in 1943. Of the 80 men, three died during the mission. The Japanese captured eight of the Raiders, of which they executed four. Many of the Raiders suffered injury during their crash landings and bailouts, some seriously. Doolittle was one of the lucky ones; he was not injured, but he lost his airplane. One of the more gripping photographs of the famous aviator shows him sitting on the wing of his crashed B-25. Of the photograph, he has said while sitting on the wing of his airplane, he believed he would go home from the war and face courts-martial for the failure of the mission and the loss of so many airplanes and men. Doolittle would go on to win the Medal of Honor for his role in developing the mission, choosing and training the men, and leading them on the mission and after, during their escape from Japanese occupied territories of China. 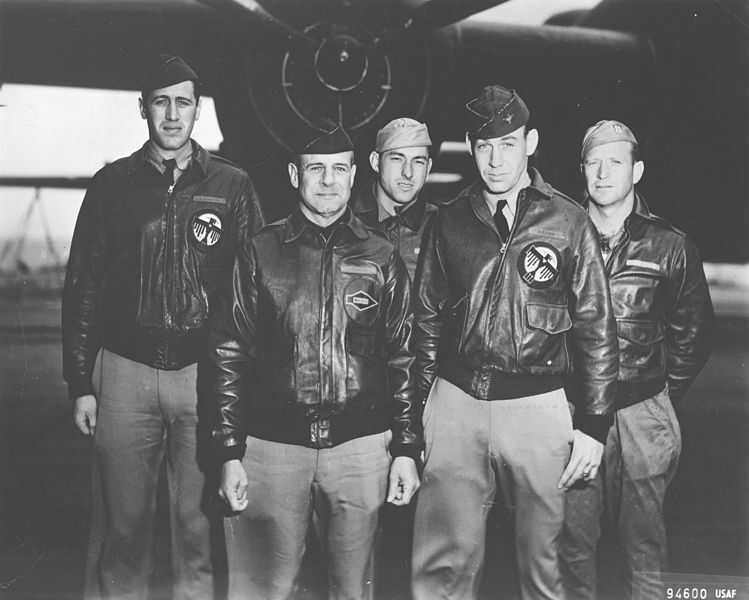 Doolittle would eventually attain the rank of general and during the latter part of World War II, he would command the Eighth Air Force in England. This entry was posted in Aviation, Aviation History, Flying, History and tagged Air Force, airplanes, airspeed, altitude, discipline, flight training, Florida, flying, judgment, military service, Navy, Pearl Harbor, pilots, World War II. Bookmark the permalink. I read his biography. Quite a remarkable man. Inexhaustible energy. The man lived and breathed airplanes. I saw one headline after the attack : DOOLITTLE DOOD IT ! What a dramatic shot in the arm for the American people and so soon after Pearl harbor. This would be especially uplifting after the surrender of 97,000 at the Philippines. The fact that only 3,000 survived shows to what level the Japanese had lost all sense of humanity as was illustrated in all their occupied nations. Perhaps expecting nations to retain any sense of humanity in total war is a bit foolish of me. My father’s cousin survived the Philippines concentration camps. He was a barber and gave haircuts to Jap officers. I would not call giving haircuts collaboration, but at least the man survived. It was his fate. Read Flyboys: A True Story of Courage by James Bradley. It captured a lot of how the Japanese lost their sense of humanity, as you put it. Well written book, one that is hard to put down once you start reading. Thank you for reminding us, once again, of the debt we owe to our veterans. Ironically, I attended an award ceremony yesterday for some of our local vets. At the reception afterwards, I was priviledged to have lunch with a young man who crossed the berm in Iraq and fired some of the first shots of Operation Iraqi Freedom. My heart filled with pride and his mother’s eyes filled with tears as we encouraged him to relate his experience. I had never met him before, but Rusty Gilbert is now one of my heroes. Many of my students are returned veterans. I hold them in the highest regards and yes, they are heroes… Thanks for a very pertinent and thoughtful comment. You know where I come from, Joe. These men’s bravery and its effects may be eclipsed someday, but I hope I don’t live to see the circumstances around that event. Nathan, I am in total agreement with you… Like you, I hope I am not around if that day ever comes. I knew Jim through his FBO at St. Augustine, Aerosport. In the 1980s, it was a great place to hang out and airplane pilots were really pilots, not just “drivers.” I was in the Navy at the time, and I disappeared as sailors tend to do on occasion, and when I return later, I was shocked to hear of his passing. I agree, most of what you find on the Internet about Jim and his father pertain to the airport. Ernie truly was the inspiration and effort behind making the airport viable and Jim carried on afterward.